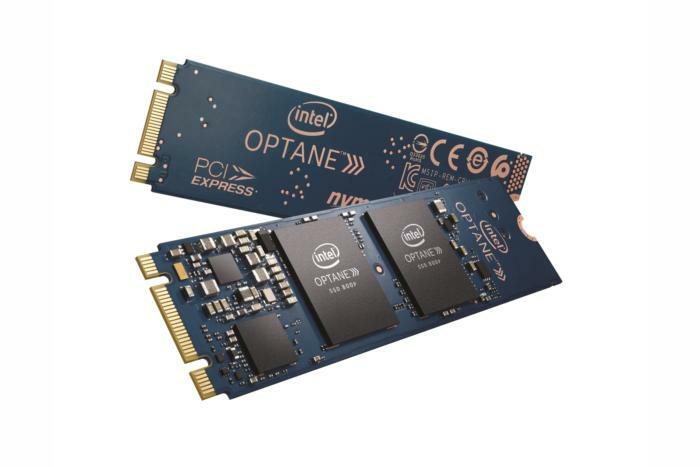 We love the potential of Optane, but current products aren't competitive price- or capacity-wise with NAND-based offerings. 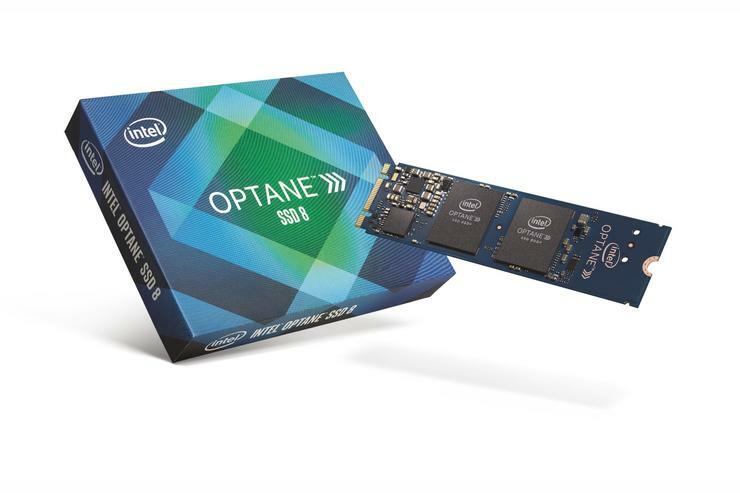 Intel’s Optane SSD 800P, like previous Optane products, boasts best-in-class longevity and very fast random access. But the rest of its performance numbers are mundane at best, it's only available in two very small capacities, and the price is, ahem, up there. Even die-hard early adopters will experience some sticker shock paying $129 for 58GB or $199 for 118GB, or $2.22 and $1.68 per gigabyte, respectively. Compared to the other NVMe drives in our SSD buying guide, which average around 50 cents per gigabyte, the 800P is over-priced and under-powered. After the lightning-fast Intel 900P we recently reviewed (currently $600 on Newegg), it's a real disappointment. We tested the 58GB version of the M.2, PCIe/NVMe 800P. Both capacities ship in the common 2280 (22 millimeters across, 80 mm long) form factor. There’s not a lot we can tell you about the 3D XPoint memory or Optane controller, other than that the memory is 3D and uses some kind of matrix addressing. Unfortunately, Intel is just not very forthcoming about this promising technology. We already mentioned that the 800P is expensive and not very capacious, but it bears repeating: $129/$2.22 per GB for the 58GB version, and $199/$1.68 per gigabyte for the 118GB version and there are no larger capacities. By way of comparison, the 250GB Samsung 960 EVO is available for $120/48 cents per gigabyte and available in sizes up to 2TB. Ahem. Elegant and long-lived, the 800P is also pricey and capacity-challenged compared to the NAND-based competition. Where you’ll recoup some of your money is via the 800P’s stellar endurance. Both capacities are warrantied for five years and rated for 365TBW (TeraBytes Written). Most SSDs vary in TBW based on their capacity, so why these two have same TBW rating we simply do not know. Intel boasts that Optane products really shine in small reads without the benefit of queues, that is, single writes performed sequentially. But NVMe is designed with multiple queues, so writes can be performed in parallel. 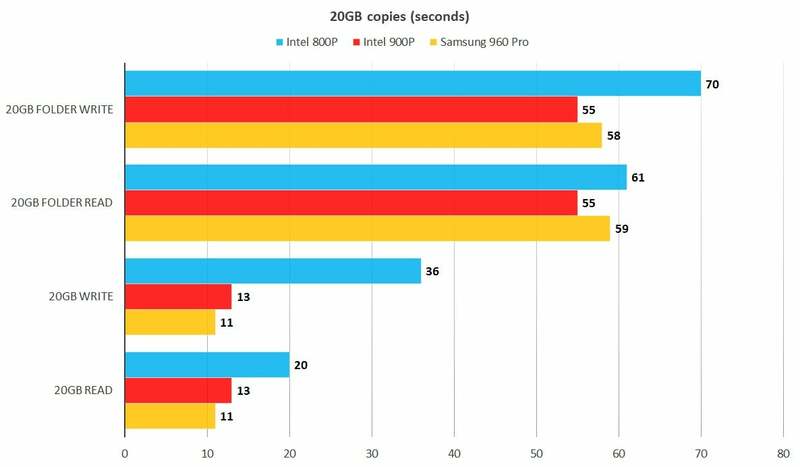 Despite Intel's boast, the 800P's small write number shone only in comparison with the rest of its performance. Both the 900P and the Samsung 960 Pro bested the 800P (turquoise bars, below) in AS SSD's queued and unqueued tests. 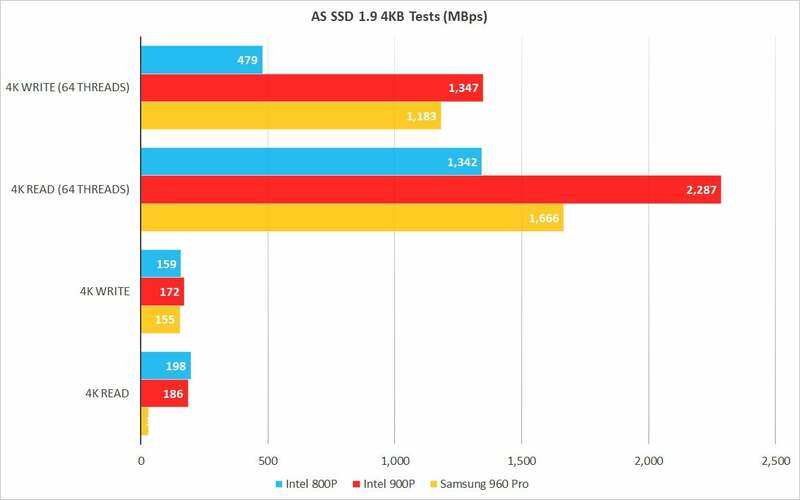 Intel's claims of superior small write capabilities were not borne out by AS SSD. Longer bars are better. Intel rightly points out that low or no queue-depth small reads comprise a great part of the average workload, and Optane’s prowess in this area does help with moment-to-moment performance. Subjectively, the 800P will provide the snappy performance that's the hallmark of NVMe drives. Sustained read performance with the 800P is good, but sustained writes are relatively weak. The Optane SSD 900P was an exception among the Optane drives we’ve seen, with stellar performance all around, but that was a closed box that may have been internally configured in RAID, as the NAND-based Intel 750 is. Speaking of which, Intel claims that 800P performance scales very well when you combine them in striped RAID arrays. We didn’t have the drives or setup to test this with NVMe, but it has been a unique strength of Intel SSDs for quite a while. At least when used with their own rapid storage technology. Note: Normally, I would’ve compared the 800P with a budget NVMe drive, which is more in line with the 800P’s performance. However, as the 800P is three to four times as expensive as say, the Samsung 960 EVO, I chose the high-end Samsung 960 Pro instead. 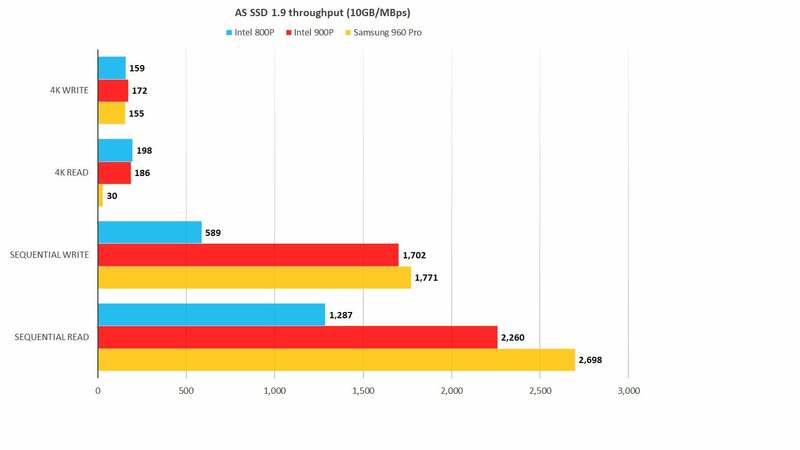 AS SSD 1.9, which issues the FUA command (Force Unit Access) to disable caching, had nice things to say about the 800P’s read speeds, especially the small 4K read (turquoise bars below; longer bars are better). Not as nice as what it said about the 900P of course, or even Samsung’s, but nothing untoward. On the other hand, the sustained write speed is quite pedestrian, barely faster than a good SATA SSD's. AS SSD 1.9 shows that the 800P, like its 900P cousin, offers exceptional 4K reading. However, it lacks the 900P’s sustained read/write prowess. Longer bars are better. 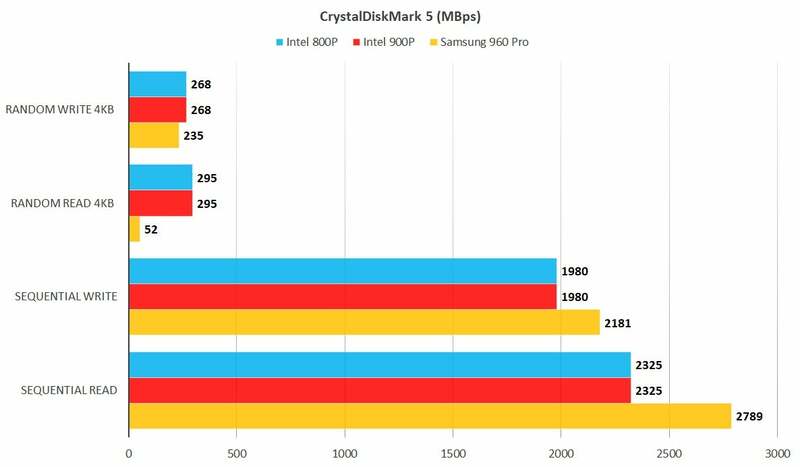 CrystalDiskMark, on the other hand, differed in opinion from AS SSD (see turquoise bars below). It shows the same fast sustained readers and 4K reads, but pegs the 800P as a fast sustained writer, disagreeing with both AS SSD and our 20GB copy tests, which appear next. Though obviously slower than the Samsung 960 Pro, the 800P offers much quicker native small writes. Longer bars are better. While sustained transfer isn’t the 800P’s strong suit, we were just a tad surprised that it didn’t do a better in our real-world 20GB copy tests (see turquoise bars below/shorter bars are better). The slow write time puts this test in agreement with AS SSD and in conflict with CrystalDiskMark. For the price, we were expecting a lot more from the 800P in our real world 20GB copying. The 960 Pro cleaned its clock and is far less expensive per gigabyte. Shorter bars are better. It’s not unusual for CrystalDiskMark to show fast sustained writes where other tests do not. For some reason, it never works outside of the cache, even when a 32GB data set is employed. We’ve found it accurate in all other regards but this. Trust the copy tests. In spite of its high price, the previously reviewed 900P, with its stellar performance and virtual lifetime guarantee, is a tempting buy for enthusiasts. The 800P, on the other hand, is most decidedly not. In pricey RAID combinations, its longevity might make good sense in the corporate world, but that’s not our realm of expertise. The average user will be much better served by NAND-based NVMe drives, which are far cheaper, will deliver significantly better all-around performance, and offer enough capacity for a world where digital stuff is ever-expanding in size.